Featured products available from ShowTrek. Formed from extruded aluminium, the ShowTrek Gate Beam is a light weight and completely seamless rigging batten. The ShowTrek Lite-Riser is low cost, light weight and easily adaptable stage module. Standard modules measure 2m x 1m featuring aluminium framework, ply-wood tops and removable legs. The shape and size of Lite-Riser modules can be tailored to suit your needs. A paint specially formulated for use in theatre applications with an optimal balance of low sheen and scuff resistance. Available in 20L and 4L tins. Drapes made from the best quality fire-retarding fabrics for installation in Theatres, Cinemas, Auditoriums, Schools, Public Halls and Clubs. Our range of fabric includes: Wool, Velvet, Velour, Molten, Blackout, Filled Cloth, Sharkstooth, Lycra, Scenery Netting, Canvas/Nessel and Chromakey. Hand winches are often impractical in general purpose venues for both aesthetic and health & safety reasons. In a dedicated drama space they may be practical but are slow and labour intensive. These low cost 5 and 6 wire winches make lifting lighting and scenery bars safe, easy and affordable. Ideally suited to Factory Trolleys and Theatre Wagons where heavy loads need to be manoeuvred with less effort. Barrel clamps for tubes with approximate outside diameter of 50mm. Suits: lighting truss, scaffold tube, 48OD steel tube. Rated Load for indoor use: 750Kg. Contact ShowTrek for more information. The JLX Pro Pre-wired Lighting Bar makes rigging lights quick and easy with power outlets built into the bar. Power is supplied to the bar through a Socapex 419 plug, combining 6 power circuits into one connector. Several JLX bars can be linked together side by side to form a single rigid bar. Inspecta-Shield fire retardant is a colourless, odourless, non-toxic, non-allergenic treatment for fabrics, timber and many other building materials. Inspecta-Shield is available from ShowTrek pre-mixed in 1L, 2L, 5L and 20L containers as well as a 1L trigger pack. The ShowTrek modular stage gives a performance venue ultimate flexibility. With completely modular stage decking and sub structure, penetrations of any size (up to the full stage) can be made with a minimum of effort. Stage modules are typically 3m x 1m (configurable to client specifications) with a load rating of 7.5KPa distributed and 20KN concentrated load. Modular choral and orchestral risers purpose built to suit each customer's requirements. With variable height, interlocking modules, durable hard wood decking and acoustic deadening interior, ShowTrek's riser systems are an asset that adds value and appeal to any performance venue. Leave your audience impressed weather it's an information display in a mall or an entire exhibition hall. Exhibitions, product launches, seasonal displays, corporate presentations, information displays, museum exhibits. Artistic park benches and outdoor displays, animal design story telling chairs or custom designed furniture and equipment to match themed interiors. Our designers and artists can help add character and vibrancy to your space. ShowTrek has the technology, creativity and know how to produce interactive video information displays to suit any application. From information terminals built into themed interiors to huge rear projection screens, ask ShowTrek to give your video display even greater impact. 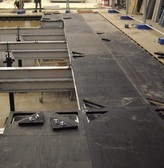 Revolving platforms and stages for displays, exhibitions and productions. Options: friction drive, belt drive, power transfer, pneumatic transfer and detachable doughnut-revolve. ShowTrek built it's reputation in the theatre industry and as our name suggests we are specialists at making shows that travel. From the set and scenery to the dollies crates and stillages for transport, ShowTrek has it covered. The ShowTrek upright transport and storage trolleys not only provide an efficient way of moving and storing ShowTrek stage riser units but also help take the hard work out of the assembly and disassembly process. Portable storage solutions for anything that needs to travel. Bütec 1000 stage modules are light weight and robust with aluminium construction and ply-wood tops. The module size is 2m x 1m with adjustable height scissor action legs that can be set from 0.2m to 1m in 0.2m increments. A dance floor of any size can be assembled quickly and easily using this system of interlocking floor tiles. Each tile is 25mm thick and has a solid oak surface in either parquet or long strips as standard. The dance floor is framed with sloped edge strips made from light weight aluminium with a gold anodised finish. Flat panel, touch sensitive, 5 zone DMX controller for architectural lighting with brightness colour and sequence speed control. Features: Ethernet, Smart-Phone Application, SD memory, customised panel graphics, 1024 DMX addresses calendar and external triggers. Simple and elegant flat panel, touch sensitive, single zone DMX controller for architectural lighting with brightness and colour control. Features: Simple 3 button lighting control, glass front panel, choice of black or white panel design, 128 DMX addresses. Pocket sized DMX lighting sequence control for retail, hospitality, exhibition or displays. Once programmed the ESA will operate without a computer. Features: Store over 200 scenes, clock and external triggers, 512 or 1024 DMX addresses. Options: MicroSD memory, ethernet, DMX-in. Complete DMX control software suite for PC or Mac. Features: Drag and drop effect sequencing, 3D visualisation, Art-Net output via computer ethernet port, DMX-in, external triggering, DMX/MIDI-in triggering, stand alone capable. TonkaTray is a one piece fully welded aluminium ute tray that sets a new benchmark for after-market trays. TonkaTray features LED tail lights, dedicated reversing lights, heavy duty tie down points and a shape designed to match the vehicle.